An article published in the journal “Astrophysical Journal Supplement Series” presents the Hubble Deep UV (HDUV) Legacy Survey program, a great panorama of the universe’s evolutionary history based on observations carried out with the Hubble Space Telescope. A team of researchers exploited Hubble’s ultraviolet detection capabilities, combining it with infrared and visible light observations, also from other telescopes, to extend previous surveys with a field of view that includes about 15,000 galaxies, including 12,000 in which there’s star formation. For several years astronomers have been patiently creating more and more complete maps of the universe by exploiting the detection capabilities in various electromagnetic frequencies of various telescopes. Most of the ultraviolet frequencies are filtered by the Earth’s atmosphere so the Hubble Space Telescope plays a crucial role as it can offer observations that also include part of the ultraviolet spectrum with its Wide Field Camera 3 (WFC3) and Advanced Camera for Surveys (ACS) cameras. 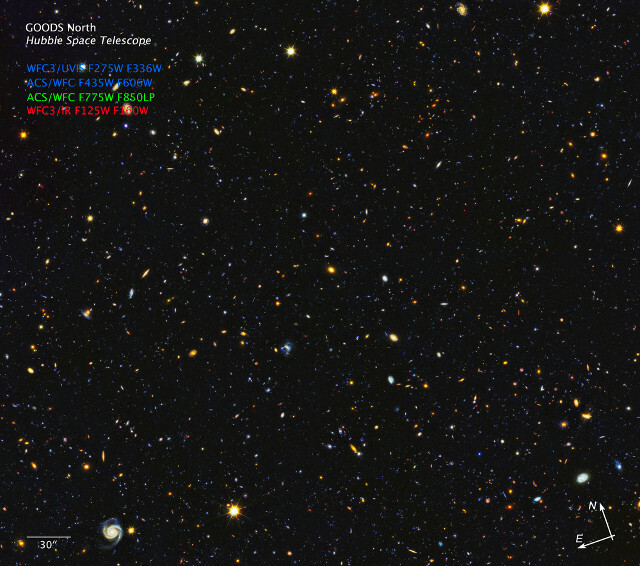 In 2014, the so-called Hubble Ultra Violet Ultra Deep Field was released, a study that contained thousands of galaxies in a mosaic of images that combined observations at ultraviolets with others at visible light obtained in a previous study called Hubble Ultra Deep Field (HUDF), whose first release dates back to 2004. 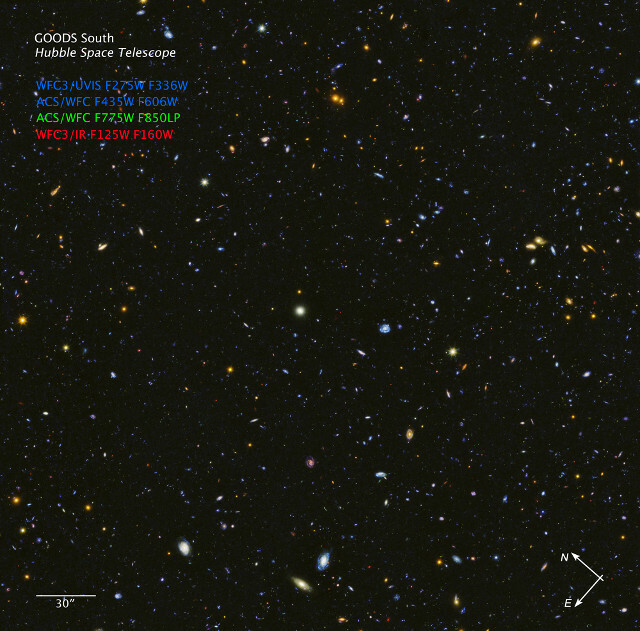 Over the years there have been other studies that combined images at various frequencies captured by Hubble such as CANDELS-Deep (Cosmic Assembly Near-infrared Deep Extragalactic Legacy Survey) in the central part of the GOODS (The Great Observatories Origins Deep Survey) fields in a total area that has become much larger. The new HDUV program offers a panorama straddling the gap between very distant galaxies that are visible at infrared frequencies only and other nearby galaxies that are visible in a wide spectrum. That’s because light from star-forming regions in remote galaxies was emitted at ultraviolet frequencies but the universe’s expansion caused the red shift of its wavelengths. An astronomers’ goal is to better understand the evolution of galaxies by comparing star formation in near and far away ones. Data for the HDUV program were obtained in the course of 132 orbits of the Hubble Space Telescope between November 25, 2014 and November 16, 2015 and 42 independent observations. The data of what was called HDUV Data Release 1.0 were published in a special section of the Space Telescope Science Institute’s website. Thanks to these investigations it’s possible to detect traces of star formation up to 11 billion years ago in very distant galaxies. Other investigations went back even further in time but each mapping of parts of the distant universe are useful to reconstruct the early stages of galaxy life. This is just one example because these surveys that offer maps and large amounts of data become points of reference for astronomers, who can then examine specific objects with other instruments and bring further knowledge and discoveries.